Country Fire Service / Where are the foum members located? Just wanting to get an idea of where users of SA Firefighters web forum are located. Country Fire Service / Pagers? We have pagers as well - but its amazing when on a rare occasion we miss our weekly siren testing and the community asks why? My question to the forum is: since the introduction of pagers a few years back could we be loosing this community alert/notification - as I have seen allot of the newer stations loose there sirens or not use them as they have pagers? I am after peoples views & ideas. Some thing we in society on occasions forget to do - that is thanking people for there efforts. As a resident of the Wilmington area I would like to pass on my thanks to the strike teams and all the other brigades whom assisted us with the fires at Horrocks Pass on the weekend. Its one thing that amazes me with the CFS comradeship and the helping volunteering spirit - top effort people, especially to give up your new years eve to help others. Country Fire Service / Rural Fire Prepardness. I was asked the other day by our neighbors to show him what we have in place(Fire Prevention wise)as he was aware I work within the Emergency Services Industry. I showed him our two fire pumps, ample water storage good clear fire breaks around house etc, with sprinklers and fire hose reals at two locations around our house. This prompt him to ask the question "is there business who can help people like him to better prepare themselfs" - some would say "leave" this is up to the individual but is there anyone whom can professionally help people like this. He did visit his Regional CFS Office whom gave him a lovely glossy pamphlet - but what he needs is some one to visit his home to give him some advise -to better prepare themselfs, and I assume there would be allot others in similar situations. 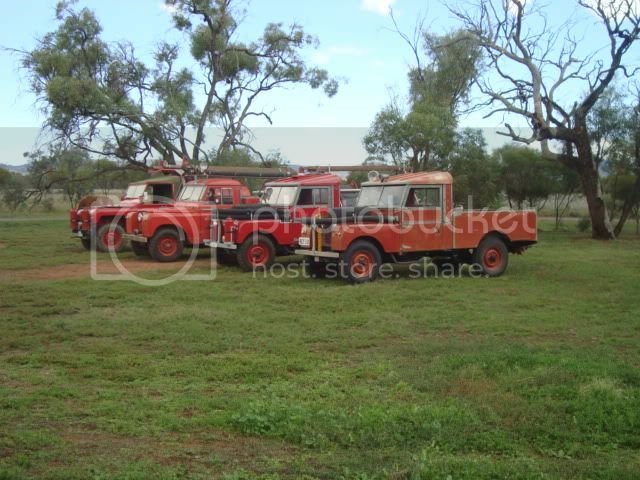 SACFS Vintage Appliances / Old CFS Vehicles. Country Fire Service / Wangary Bushfire - Independent Review. Was sent the link to the independent review of circumstances surrounding the Eyre Peninsular Bushfire of 10th and 11th January 2005. 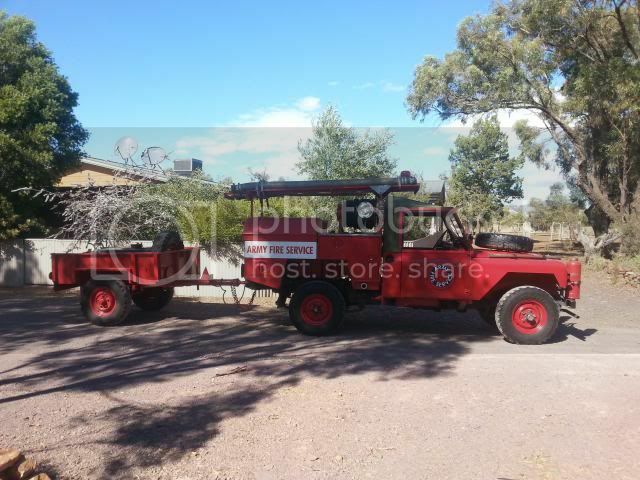 Here is some pictures of the vintage fire trucks used for the Royal Show CFS display. Currently being totally rebuilt to the original plans. If anyone can shed any light on where the vehicle was stationed it would be greatfully appreciated. Within the CFS book - tried by fire there is a brief picture of the vehicle (I think) but there is no visall of the pump etc. Thought you all might like. I have some pictures of some old appliances from SAMFS. SACFS Vintage Appliances / Series IIA 1964 Land Rover Fire Engine. 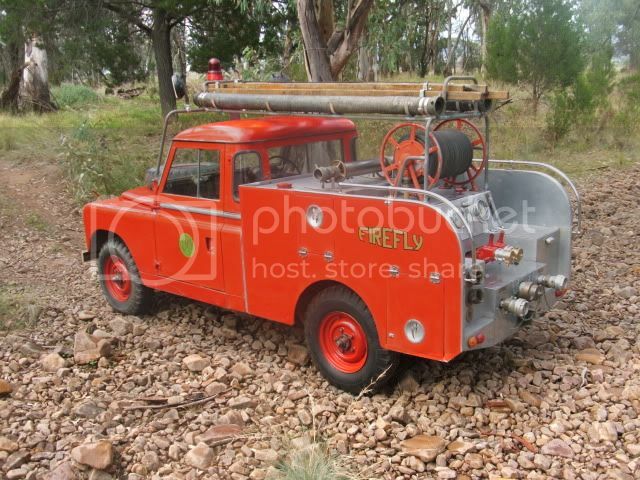 The second of my vehicles is a 1964 Ex Army Fire Tender - after is Military life it was used at the now closed township in the far North of SA (Kingoonya) - histroy is a little vague but believed to be bought by the Kingoonya township people for fire protection. 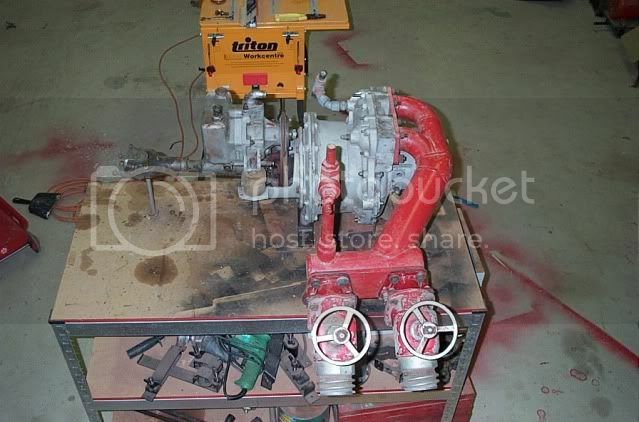 I purchased the vehicle in 1999 and it it currently being totally rebuilt as the bore water through the pump has had catastrophic effect (total rebuild of the pump). As the Moderator of the site - I am passionate about preserving our Fire Fighting History, I have a vast collection of gear which branches out into collection Fire Engines. I have always been passionate about the Land Rovers, and I purchased this vehicle in 2000 - from the Wellington area. 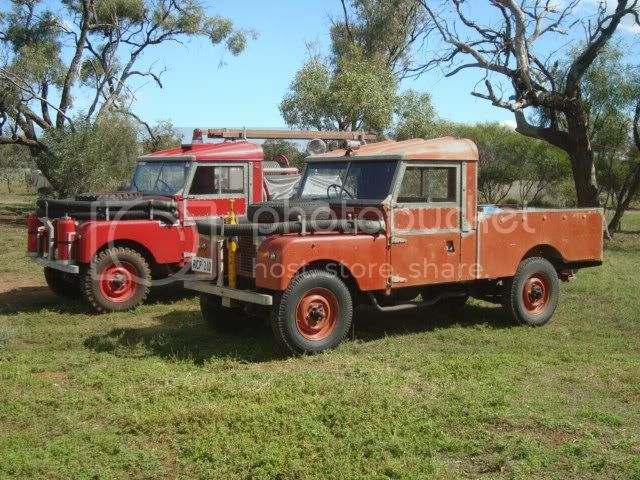 Its a 1958 Series I Land Rover Ex Woomera Emergency Services - done only 12000 miles. Its fitted with a PTO driven 300 gallon per minute pump. Its totally original except for the white paint - the original red colour is visable under some of the wear and tear marks. SAMFS Vintage Appliances / Moderator "Historical Section"
This new section is for historical MFS vehicles & Equipment - please feel free to post pictures and information etc. If you have any problems please feel free to contact me. SACFS Vintage Appliances / Moderator "Historical Section". This new section is for historical CFS vehicles & equipment - please feel free to post pictures and information etc. What does the forum think of this article - true or false. COUNTRY Fire Service volunteers are ill-equipped to deal with a biological or radioactive terrorist attack, but have been told they would be called upon in such circumstances, the State Opposition says. Liberal Emergency Services spokesman Angus Redford said yesterday it was "alarming" that CFS volunteers lacked sufficient training at a time of growing terrorism concerns. However, the Government has rejected Mr Redford's claims, saying the Metropolitan Fire Service was the "lead agency" for chemical and biological responses and CFS volunteers had received "basic training" so they could recognise risks and call for more experienced personnel. Mr Redford said the Jamestown CFS brigade had received a six-hour training session in dealing with chemical, biological and radiological (CBR) hazards and had been told it was "fully trained". "The brigade volunteers were also informed that they could also be called on to assist in the aftermath of a CBR incident anywhere in Australia. These events could range from a minor chemical spill to a major terrorist attack using biological or even radioactive weapons." But Emergency Services Minister Carmel Zollo said the MFS employed three full-time chemical and biological specialists and the CFS also had "fully trained specialists" in this area. "CFS volunteers are provided with basic . . . training so that they can recognise potential risks, isolate those risks and then call for more experienced personnel to attend," she said. The CFS said it had 346 trained hazardous-material operators, including a state HAZMAT brigade. 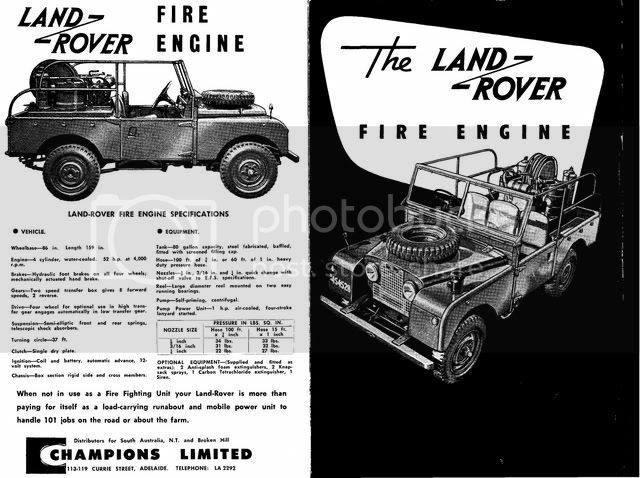 We are only a new club but have attracted several members with Land Rover Fire Engines which are in various states of restoration. 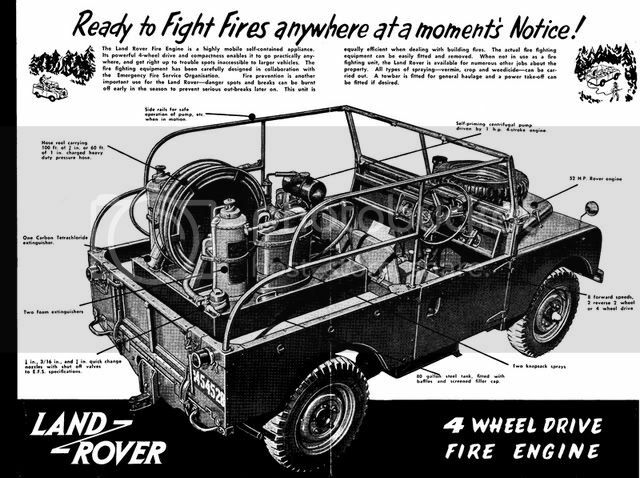 We would love to hear about other Land Rover which may have been used within the fire service you may know about. Country Fire Service / Museum? Just a question for the Forum. Considering and looking at the option of starting a fire Museum in SA - I would like to get some feed back from the forum as to how do think it would go? Please feel free to have your say? 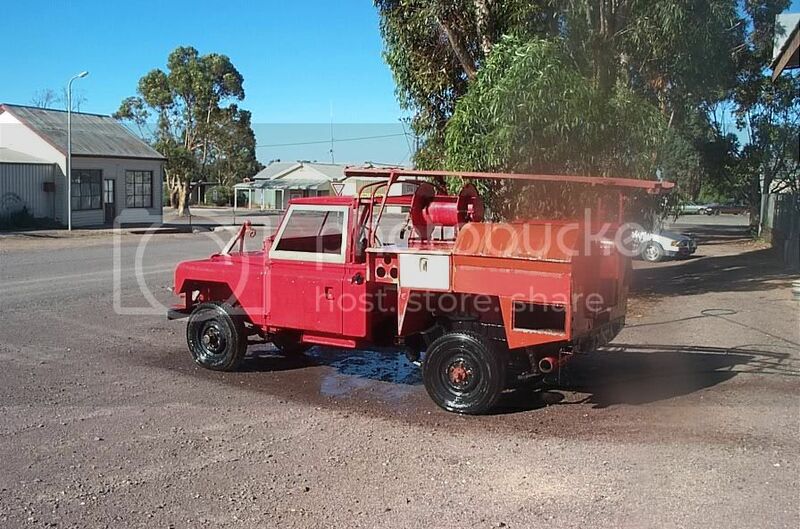 For those whom are into restored or restoring fire fighting vehicles, give this short cut to the SAFER (South Australia Fire Equipment Restorer) site a try. The site is only in its infancy but has a great potential for restorers of Fire Engine/Trucks. First time on the site - what a great site - exellent idea. I would like to start the section with three vintage fire vehicles.